There was no immediate claim of responsibility but Kurdish militants have staged similar attacks on the security forces before, including one last month in Istanbul. Security concerns were already hitting tourism and investor confidence. Wars in neighbouring Syria and Iraq have fostered a home-grown Islamic State network blamed for a series of suicide bombings, while militants from the largely Kurdish southeast have increasingly struck in cities further afield. President Tayyip Erdogan vowed the Nato member's fight against terrorism would go on, describing the attack on officers whose jobs were to protect others as "unforgivable". 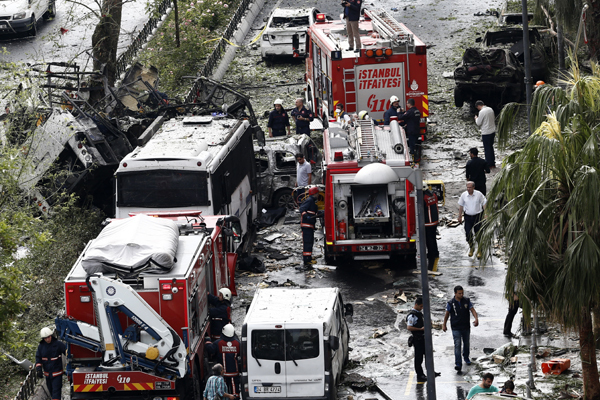 Sahin said the dead included seven police officers and four civilians and that the attack had targeted vehicles carrying members of a riot police unit. Three of the 36 wounded were in critical condition, he said. US Ambassador John Bass condemned the "heinous" attack and said on Twitter the US stood "shoulder to shoulder" with Turkey in the fight against terrorism. That has hit tourism in a nation whose Aegean and Mediterranean beaches usually lure droves of European and Russian holidaymakers. Russians stopped coming after Turkey shot down a Russian warplane over Syria last November. "Business hasn't been very good anyway. We're now expecting fast check-outs and we think it will get worse," said Kerem Tataroglu, general manager of the Zurich Hotel, less than 300 metres from where Tuesday's blast happened.